Bear Creek Golf Club is the site for the 2019 Greater St. Charles County Chamber of Commerce Annual Golf Tournament. Bear Creek Golf Club was designed by noted architect Gary Kern and opened in 1998. With the direction of the owners, Gary Kern designed the unique championship-style golf course to include 47 green and fairway bunkers, beautiful lakes and several large creeks that run throughout the course. This included the preservation of most of the trees and natural habitat allowing each hole to have its own unique features, challenges and beauty. 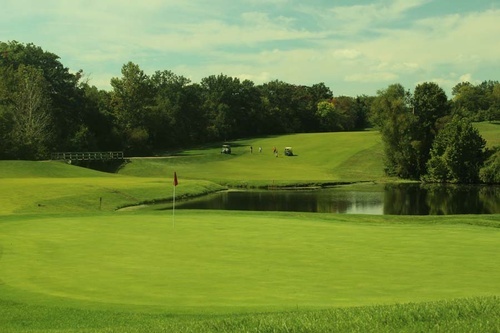 The course can play more than 7,000 yards and is ranked one of the toughest public golf courses in St. Louis. Tee off from any of the 4 sets of tees and land on over 25 acres of zoysia and bluegrass fairways. Bring your putter to master the large undulating bent grass greens and mark your scorecard lightly. The layout stretches across 150 acres with beautiful homes set back along the course's perimeter. Over the years Bear Creek has become known by most of the avid golfers as "The Home of the Grizzly".